Equipación de fútbol para niño España Fútbol 2018-2019 Home. 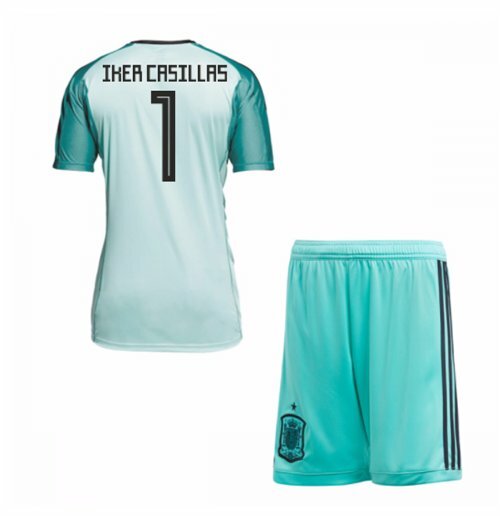 2018-19 Spain Home Goalkeeper Mini Kit (Iker Casillas 1). OfficialIker Casillas footballshirtfor the Spanish national team. This is the newSpain goalkeeper homeshirtfor the2018 world cup which is manufactured by Adidas and is available in adult sizes S, M, L, XL, XXL, XXXL and kids sizes small boys, medium boys, large boys, XL boys.This Spain footballshirtis Sky Blue in colour and comes withIker Casillasshirtprintingon the jersey.